I’m a sucker for puff pastry – how can one not like this crispy, light, flaky, buttery, rich and indulgent pastry? 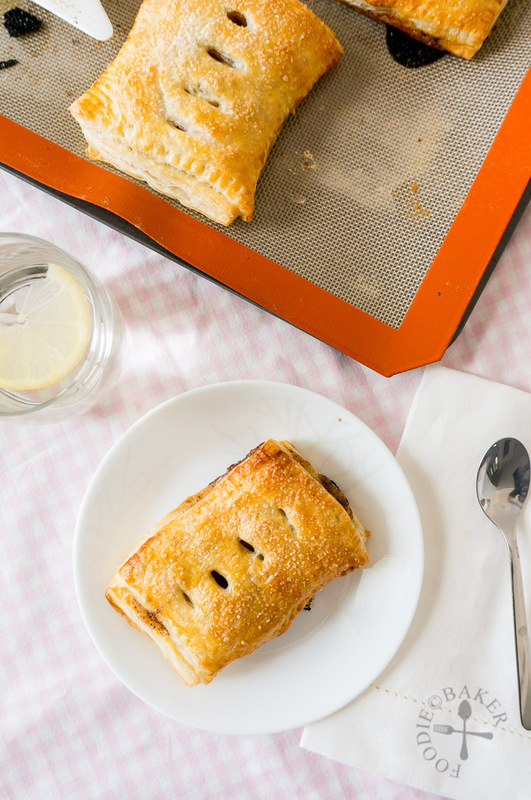 Be it plain like croissants, stuffed with chocolate, fruits, or savoury stuff like mushrooms and cheese or simply a topping on pot pies – as long as they contain puff pastry, I know they are definitely winners, and so are these puff pastry apple pies! 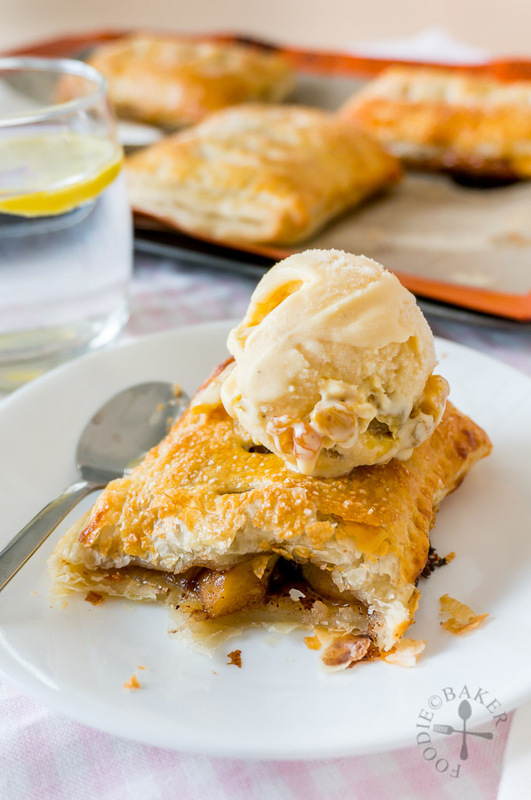 These puff pastry apple pies are soooo good when warm from the oven and even better with a scoop of ice cream on top – I mean what can be better than the combination of sweet and sticky caramel apples, crispy and flaky puff pastry and cold and *boozy* ice cream?! When it becomes cold, the puff pastry will lose its crispiness but I kind of enjoyed it as well – it reminds me of how I usually have stale croissants for breakfast during my school days because they are bought the night before at the bakery. But if you like the crispness – just reheat them in the toaster oven or a preheated oven and they will be perfect. And here’s how to make them! 1) Peel, core and dice the apples into 1/2-inch cubes. 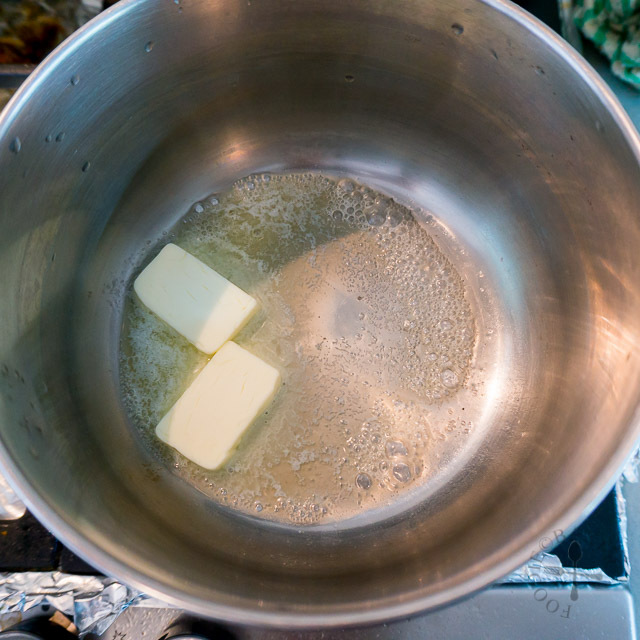 2) Melt the butter in a small pot over medium heat. 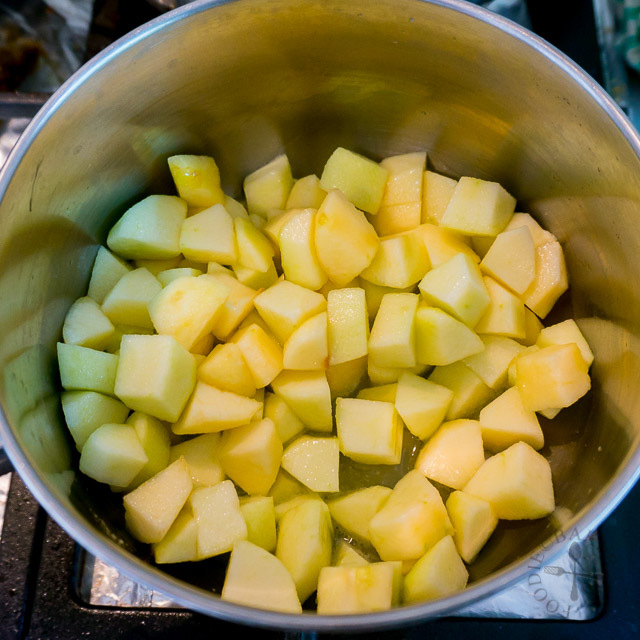 3) When the butter has stopped foaming, add in the apple cubes. 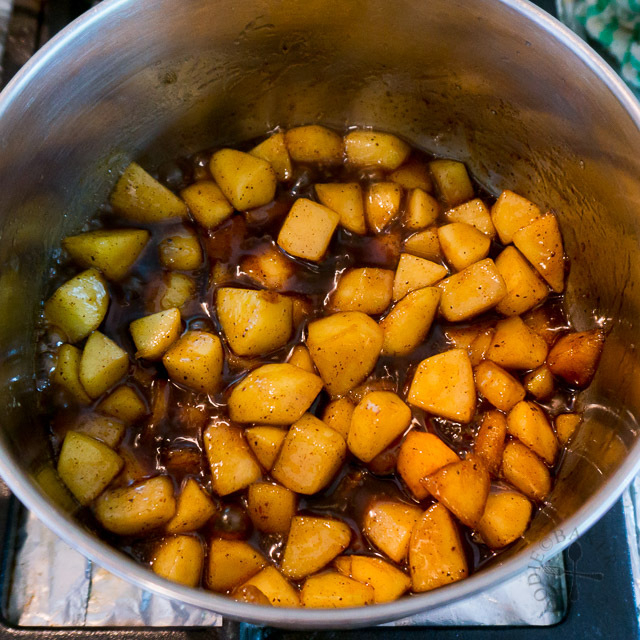 4) Cook for 5 minutes, stirring occasionally until the apples have softened. 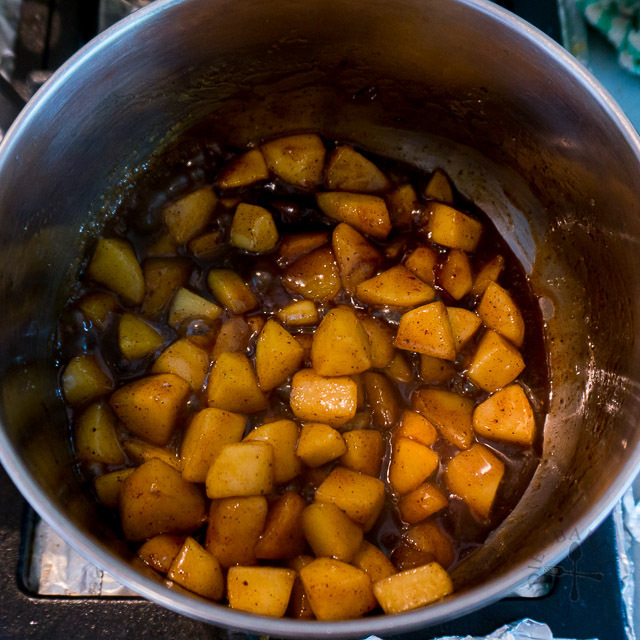 5) Add in dark brown sugar and cinnamon 6) Stir to mix them with the apples. 7) Lower the heat to low and continue to cook for 3 minutes. 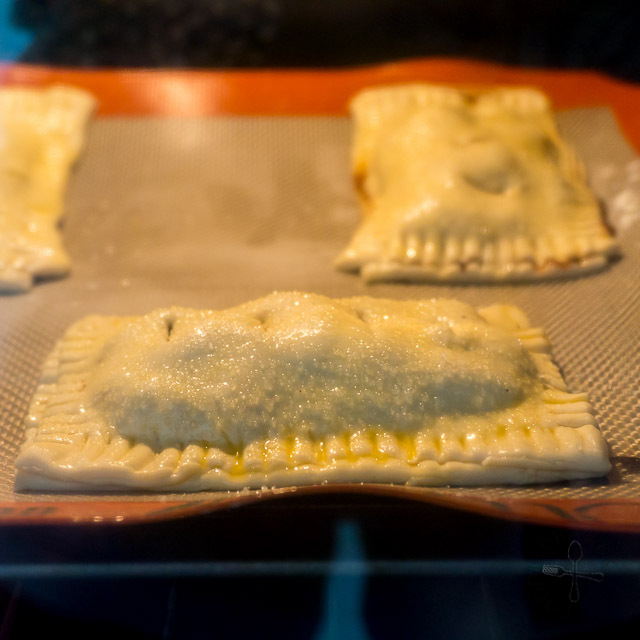 Remove from heat and set aside to cool while you prepare the puff pastry. 8) Dust a baking parchment with plain flour. Unroll the puff pastry on top of the baking parchment and dust with a little bit of plain flour. Roll it out to make it thinner, slightly thinner than 1/8-inch thick. 9) Divide the puff pastry into 8 pieces. (You can also cut the puff pastry into 4 long strips and fold them over to enclose the apples.) 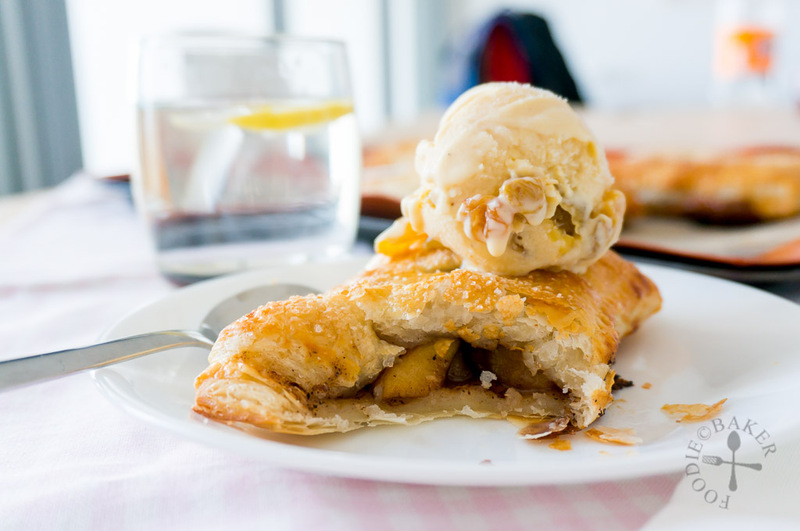 10) Divide the apple and the juices among 4 pieces of puff pastry. 11) Brush the edges with the beaten egg. 12) Top each piece with another puff pastry, stretching slightly so that the edges of both puff pastries meet each other. Press down on the edges with your fingers to seal them together. 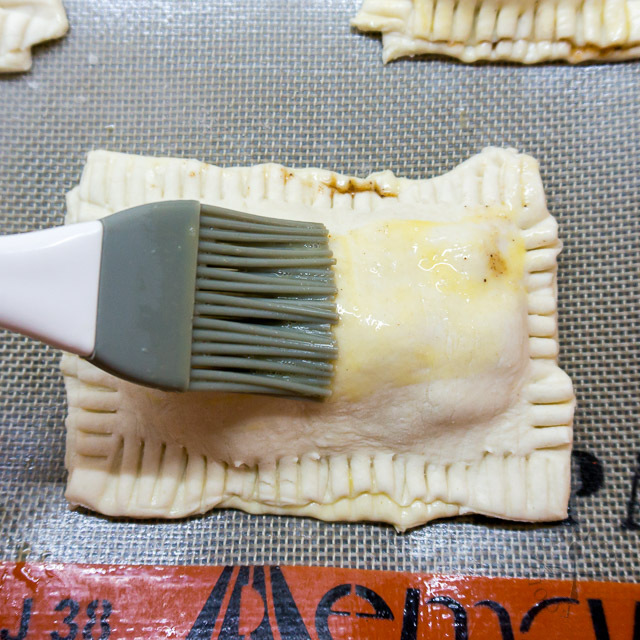 Use a fork and press down on the edges of the puff pastries to help to seal them together and for decoration. 13) Slide the baking parchment (with the apple pies) onto a baking sheet. Brush the apple puffs with a thin layer of beaten egg. 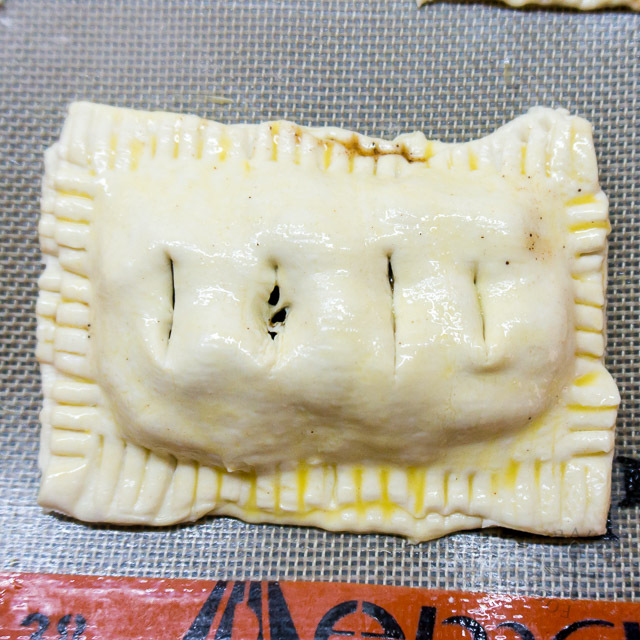 14) Use a knife and cut slits on the top puff pastry (don't cut all the way through) for steam to be released. 15) Sprinkle caster sugar all over the top of the apple puffs (the egg will help the sugar to stick on top). 16) Bake the apple pies for 18 to 20 minutes until golden-brown, rotating the baking sheet halfway through baking. Best served warm with a generous scoop of ice cream! Preheat oven to 200C / 400F (not fan-assisted). 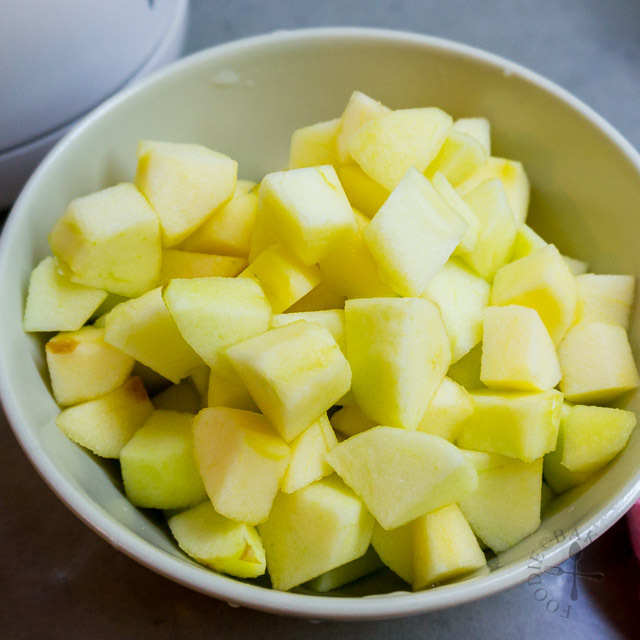 Peel, core and dice the apples into ½-inch cubes. You will end up with about 250 grams (about 3 cups) of apple cubes. Set aside. Melt the butter in a small pot over medium heat. 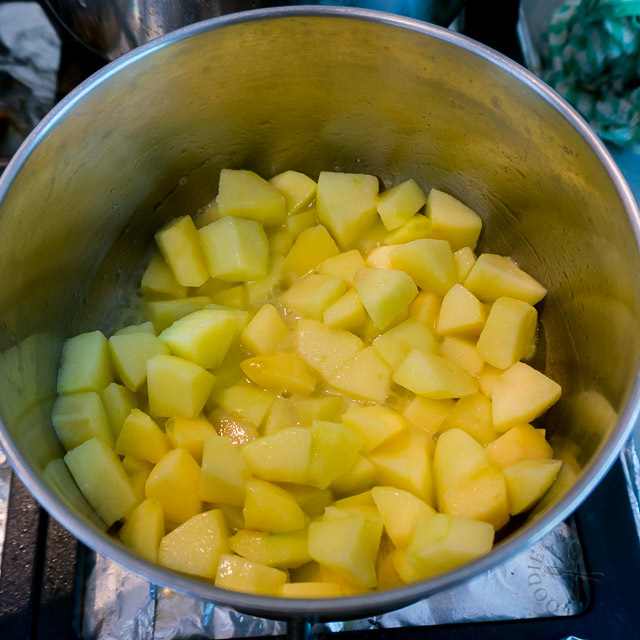 When the butter has stopped foaming, add in the apple cubes and cook for 5 minutes, stirring occasionally until the apples have softened. 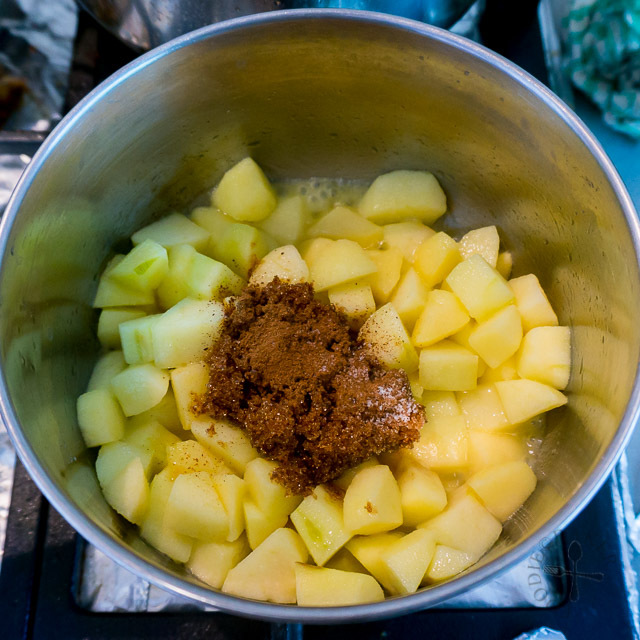 Add in dark brown sugar and cinnamon and stir to mix them with the apples. Lower the heat to low and continue to cook for 3 minutes. Remove from heat and set aside to cool while you prepare the puff pastry. Dust a baking parchment with plain flour. 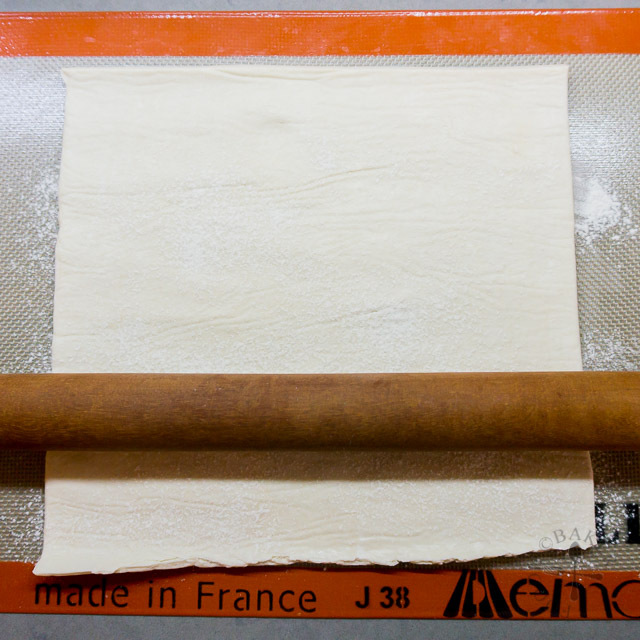 Unroll the puff pastry on top of the baking parchment and dust with a little bit of plain flour. Roll it out to make it thinner, slightly thinner than ⅛-inch thick. Divide the puff pastry into 8 pieces. 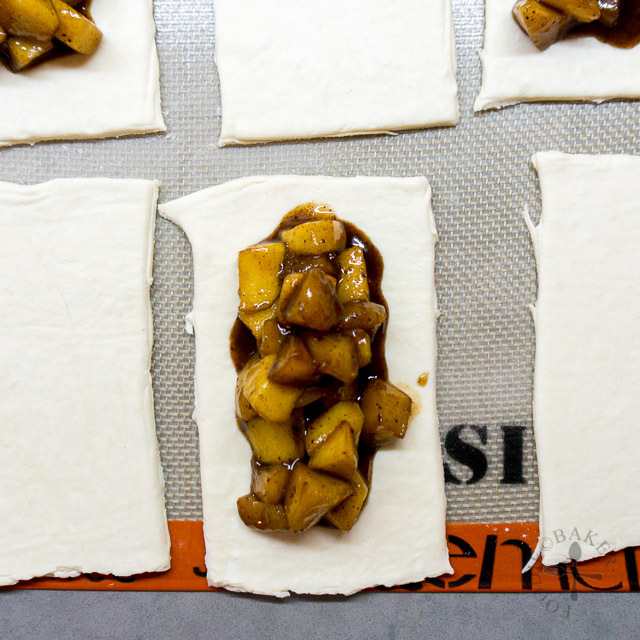 Divide the apples and the caramel/juices among 4 pieces of puff pastry. Brush the edges with the beaten egg then top each piece with another puff pastry, stretching slightly so that the edges of both puff pastries meet each other. Press down on the edges with your fingers to seal them together. Use a fork and press down on the edges of the puff pastries to help to seal them together and for decoration. 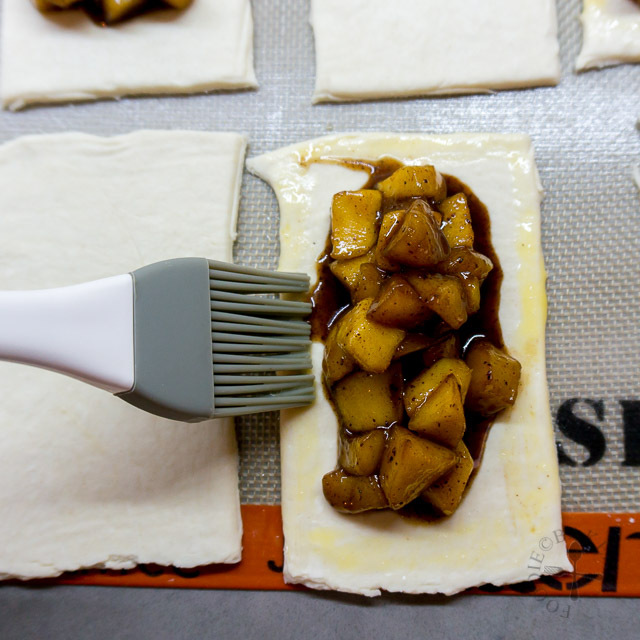 Slide the baking parchment (with the apple pies) onto a baking sheet. Brush the apple puffs with a thin layer of beaten egg. 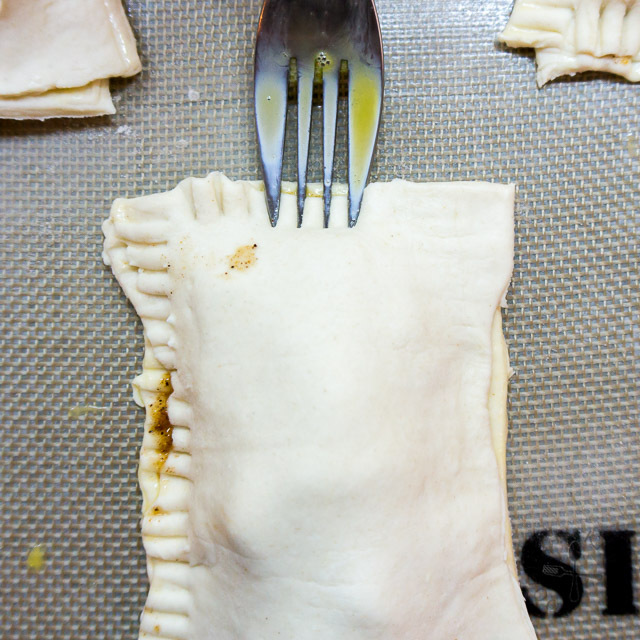 Use a knife and cut slits on the top puff pastry (don't cut all the way through) for steam to be released. 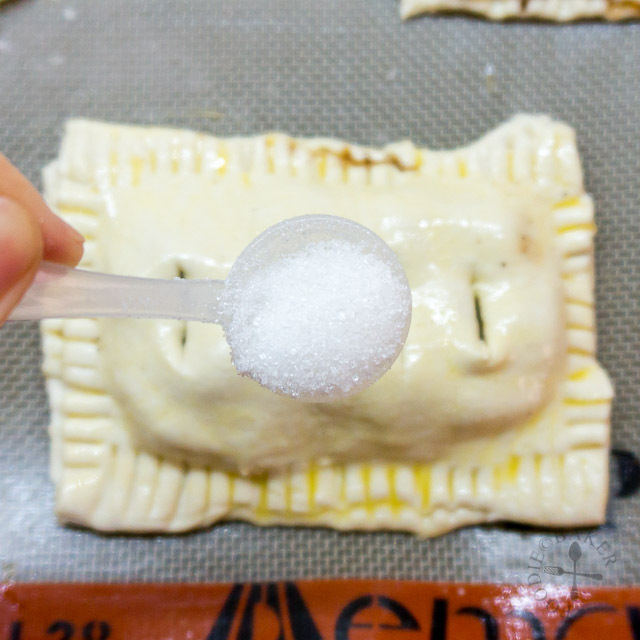 Sprinkle caster sugar all over the top of the apple puffs (the egg will help the sugar to stick on top). Bake the apple pies in the lower rack for 18 to 20 minutes until golden-brown, rotating the baking sheet halfway through baking. Let the apple pies cool slightly before serving. The pies are best served warm but will still taste awesome at room temperature. You can warm up the apple pies in a toaster oven or a preheated 180C / 355F oven for about 5 to 10 minutes. Store leftovers (if any) in an airtight container in the refrigerator. - If your puff pastry comes in a roll instead of sheets, it's best to thaw the pastry overnight in the refrigerator before using. 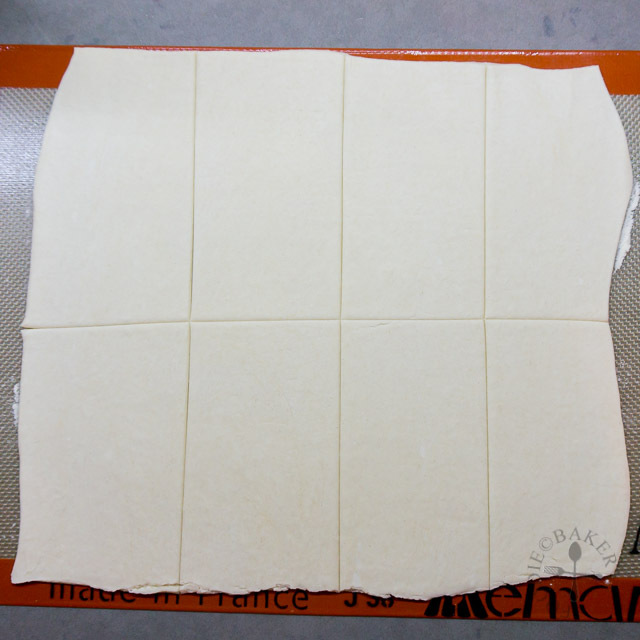 - You can also cut the puff pastry into 4 long strips and fold them over to enclose the apples. - Do bake the apple pies on a silpat or baking parchment as the caramel might leak and clean-up will be a lot easier. Can you please give me one of yours? I love these apple pies! The ice cream on top made it even more delicious! I love apple pies! wish I could have one of yours! Looks so good! I’m with you … love using frozen puff pastry for bakes as it cuts down the time. 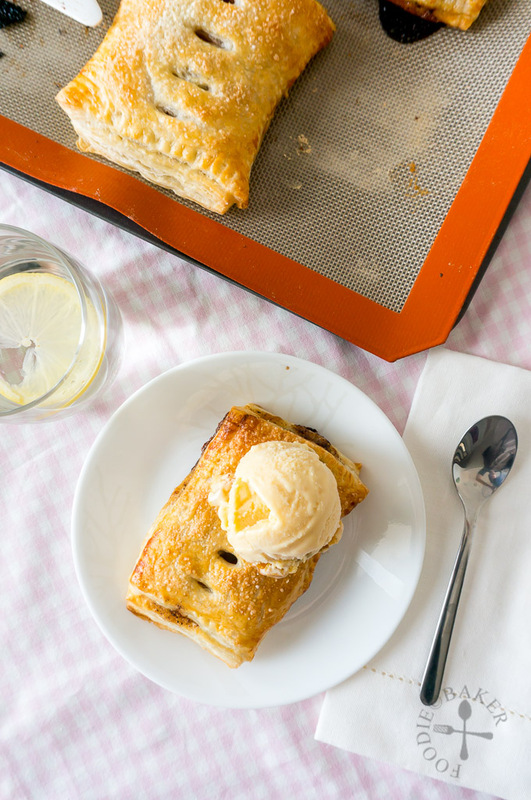 That scoop of ice cream serves with warm apple pie sets me drooling ! My favourite!! This makes me think of my favourite MCD apple pie ;P Now there is a homemade alternative to that! Thanks for this recipe. I’m going to bookmark it. Oh this is so gorgeous! I love how your pictures show the perfect flakiness of them. I can only imagine how amazing these must be!